Born November 16, 1924, in Kiowa County, Colorado. Died January 13, 2008, at Eads, Kiowa County, Colorado. Married December 4, 1941, at Raton, New Mexico. Lawanda Rose Fischer, b. January 21, 1943, at Eads, Kiowa County, Colorado. Kathleen Anne Fischer, b. February 18, 1947, at Eads, Kiowa County, Colorado. Wesley Victor Fischer, b. February 28, 1949, at Eads, Kiowa County, Colorado; d. January 10, 1965, at Eads, Kiowa County, Colorado. Milton Scott ("Scoot") Fischer, b. October 23, 1951, at Eads, Kiowa County, Colorado. Reta Darlene Fischer, b. January 15, 1956, at Eads, Kiowa County, Colorado. Betty Lee was a bright and curious child-so bright she was skipped a grade while attending Lake Center School. She loved to read, and when the family moved to town in 1935, she was amazed at all the books in the library across the street from the new home. She decided to read every book in the library, and started on the top shelf in the northwest corner. Betty's first real job was at her parents' grocery store in 1937. She learned to figure accounts with a pencil, since there were no adding machines, to make change, and to take care of customers. These skills served her well her whole life. 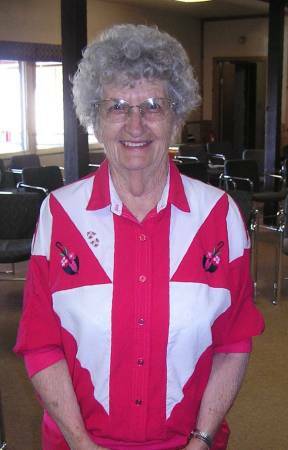 She worked as head bookkeeper at First National Bank, worked in a CPA office, and was a postal clerk. She retired from the postal service after 21 years of service. When her children were young, Betty was a leader in 4-H, a den mother for Cub Scouts, Sunday School teacher, and homeroom mother. After the children were grown, she developed a strong interest in local history. She gathered and edited many stories on the history and people of Kiowa County, and started and curated the Kiowa County Museum.